The web browser is just one of many ways you can start and end your shifts in Deputy. You will not be able to start shifts using the web unless your administrator has specifically allowed you to. If you cannot follow the instructions below we recommend contacting the administrator. As the website is the same on your computer, smartphone and tablet you may follow these instructions using a web browser on any of those devices. If possible we recommend using Google Chrome or Mozilla Firefox to use Deputy. Where Do I Start My Shift? Please click it and you'll see the list of areas from the locations you're assigned to. Please select one, then click "Start Shift". To end your shift via the web browser, please navigate to the Me tab, where you will now see the option to end your shift or start a break in the top right corner. 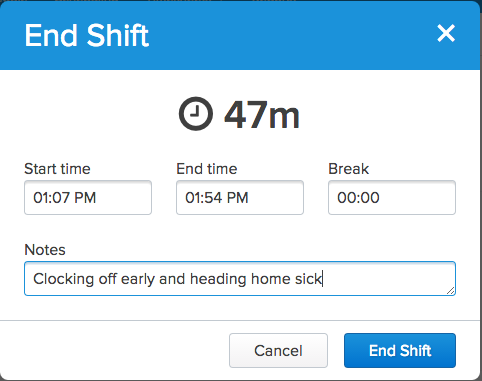 When ending a shift, you'll have the option to leave a comment in the Notes section, which you may use to notify your managers of anything that may have occurred while you were on shift. They'll be able to see this when approving your timesheet later. You can also confirm or adjust your times as necessary here.